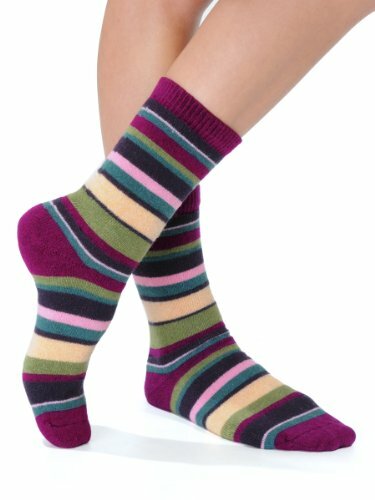 Everyday Luxury Cashmere blend Crew Socks in Multi Colored Striped print. Love these socks! Was afraid they would be scratchy because of the wool content but they are soft and comfy! The only reason they didn't get five stars is that they could be slightly longer. The socks are as garish in color as in the photo, but they are very warm and soft, and they have held up well to wear/washing. I LOVE these socks!!! They are SO VERY SOFT & COMFY!!!! Great fit too!!! I LOVE the colors!!!!! I definitely recommend these socks!!! !